In this episode, Gabe and Ian dive into the ways that contextere is delivering relevant information right into the hands of the men and women working on job sites around the world. They discuss how AI and AR will continue to grow and change, and the ways that both will continue to make job sites and the employees on them safer and more efficient than ever before. IT Visionaries is brought to you by The Lightning Platform by Salesforce. The Lightning Platform is a leading cloud platform that makes building AI-powered apps faster and easier. With Salesforce, now everyone is empowered to build apps for their organization! Learn more at salesforce.com/buildmobileapps. After a career in app development and with experience as a CTO, Josh Knell (LinkedIn, Twitter) joined Lambda School to help change the way students think about coding, school, and learning. As the director of instruction, Josh is constantly innovating and adjusting the Lambda curriculum in order to make sure that his students are as prepared as possible when they graduate from the program and enter the real world. In this episode, Josh and Ian discuss the challenges associated with creating and maintaining an online coding boot camp designed to change the face of education. Plus they dive into what it means to have a community of well-trained graduates and how Josh’s past experience as a CTO helps him excel in his role today. Topics Discussed: CSS, innovation, growth, development, education, technology, CTO, coding, HTML, app development. Marene Allison (LinkedIn) has seen a lot in her career and her life. She was one of the first women to graduate from West Point and then went on to a role at the FBI bringing down some of the largest drug rings on the East Coast. Eventually, she moved on to the private sector to head up security for A&P Foods and today, she is the Vice President and Chief Information Security Officer for Johnson & Johnson. 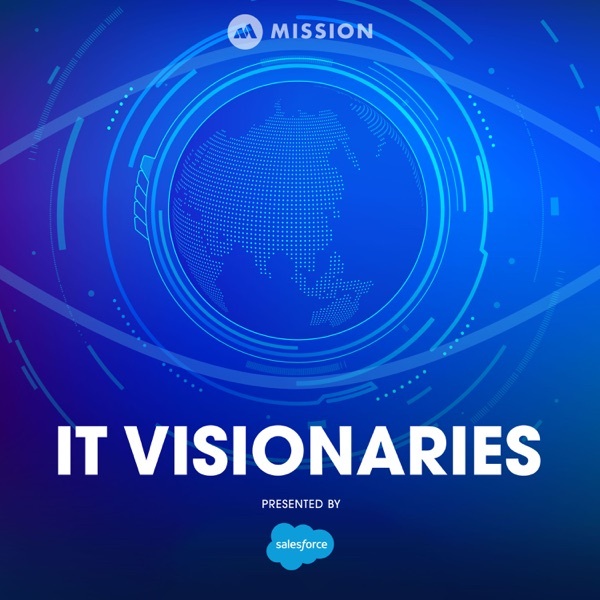 On this episode of IT Visionaries, Marene discusses her entire journey, as well as everything she’s learned, what it means to lead IT and security for a worldwide organization, what the future of AI and consumer privacy looks like, and much more. The Mission publishes the #1 newsletter for accelerated learning. Join our community of hundreds of thousands at themission.co/subscribe. As the Chief Business Officer, Vijay brings his experience in engineering, technology, research and investing to catapulting SparkCognition to new and exciting industries and innovations. In this episode, Vijay and Ian discuss everything from how and why to invest, and the exciting projects SparkCognition is working on including autonomous everything from planes to powerplants and more. This Salesforce crew is part of the team that is bringing Einstein and voice technology to customers everywhere, and they took some time away from the labs to discuss with Ian all the ways Salesforce is doing innovative work in this exciting field, what is going on in the AI marketplace, explain what deep learning technology actually is, and look into the future and talk about what technology of the future has them most excited. Topics Discussed: Voice technology, deep learning, AI, IT, unstructured data. Eric Tan (LinkedIn,) has been on both sides of the IT coin as a consultant and now in an operations role as the VP of Business Services and IT at Coupa. In this episode of IT Visionaries, Eric discusses how he grew up destined to be in IT, despite a segue as a CPA, what it means to join and lead a company that has doubled in size twice since he joined the organization and the challenges growth presents, and the excitement that comes when innovation happens in every part of the organization. Topics Discussed: Cloud technology, AI, machine learning, UI, CIO, growth, innovation. There is no question the IT security is becoming one of the most important areas of focus for companies large and small. As more and more data is being collected and shared, it also needs to be more protected. At Forescout, Julie Cullivan (Twitter, LinkedIn) serves as the Chief People and Technology Officer and works to make sure that businesses around the world are prepared with the most advanced tech possible to keep them safe. In this episode of IT Visionaries, Julie discusses with Ian how she found her way into the world of IT and the role of CIO, what it means to be responsible for the IT security of a company, and what the future holds for the industry as a whole. Topics Discussed: Security, cybersecurity, technology, IT, OT, diversity, inclusion, women in tech, AI, machine learning, big data. Ali Bouhouch (LinkedIn) has more than 20 years of experience in the tech industry and he currently serves as the CTO & VP of Enterprise Architecture at SEPHORA. It may seem odd that a makeup company has such an intense focus on tech, but when you dig a little deeper, it’s clear that technology is a key driver in the retail industry and a large part of how Sephora will grow in the future. In this episode, Ali and Ian discuss applications that allow customers to virtually try on Sephora products, how the company is using AI and big data and so much more. Topics Discussed: Innovation, AI, retail, VR, technology, customer experience, machine learning, applications. On this special episode IT Visionaries producers Aaron Gerlitz and Hilary Giorgi interview Louise Charles who head up communications for Climeworks (Twitter, LinkedIn), a carbon-capturing company based in Switzerland. Louise discusses the origins of Climeworks, how they are using technology to remove carbon from the atmosphere and some of the biggest technical challenges facing their company, and the environmental IT industry as a whole. Anthony Pompliano (Twitter, LinkedIn) is a Founder & Partner at Morgan Creek Digital and a crypto influencer. What that means is that Anthony is deeply involved and invested in how cryptocurrency will continue to evolve. Anthony believes crypto and other digital currencies are the way of the future because of their ability to be both secure and transparent. In this episode, he and Ian discuss the ways in which crypto has become more popular even in its infancy, and the path it will take as it matures into a widely-used method of payment and asset management. As the CIO of Rubrik, Avon Puri is leading a team that is creating the infrastructure that makes it possible to work across multiple clouds easily and efficiently, all while keeping your data secure. Alan Amici (LinkedIn) is the Vice President and Chief Technical Officer of Transportation Solutions for TE Connectivity. Which, in layman's terms means that he is responsible for making our cars and vehicles more high tech and connected than ever before. Alan grew up in Detroit, Michigan, so his love of cars runs deep. He turned that love into a 30-year career at Chrysler and now doing incredible things with TE Connectivity. Throughout his decades in the industry, Alan has not just seen the transformation of cars from simple machines that get us from point A to Point B to highly intelligent vehicles that can drive themselves, he’s been a part of making it a reality. In this episode of IT Visionaries, Alan and Ian discuss everything from how Formula-E Racing informs consumer car technology, to the future of autonomous driving and more. Topics Discussed: Autonomous vehicles, driverless cars, 5G, transportation, connectivity, electric vehicles, innovation, IoT, wireless technology. In this episode of IT Visionaries, Aaron Gerlitz (Twitter, LinkedIn) returns to discuss with Ian the CIO Roundtable No. 2 Episode. Aaron breaks down for the listeners exactly what it means to be a vendor versus a partner, he details his favorite vendor story and then reveals how the voice of the customer is one of the most important feedback loops for a company to keep an eye on. Topics Discussed: Vendors, voice of the customer, IT, CIO. Marcus Carey (Twitter, LinkedIn), the founder and CEO of Threatcare, actually grew up in Texas with very little access to technology. But that changed when he joined the Navy and went into cryptology. While serving the country, Marcus worked with the most advanced tech in the world. And, when his service time was finished, he stayed in the field working in various government agencies for a number of years. At Threatcare, Marcus applies the lessons he’s learned along the way to help his customers secure their data and test their cybersecurity. In this interview, he and Ian talk about what it means to be a white-hat hacker versus a black-hat hacker, creating automated technology, and finding your superpower. Topics Discussed: Technology, cryptography, white-hat hacking, black-hat hacking, cybersecurity, entrepreneurship, leadership. In his second appearance on the podcast, Juan Perez, the Chief Information and Engineering Officer for UPS, discusses creating a diverse workforce. As the CTO of Stitch Fix, Cathy Polinsky is using everything from mobile apps to internal software to completely disrupt the world of online shopping. Three leading CIOs, Alvina Antar (Zuora), Paul Chapman (Box), and Mark Settle (Okta), join Ian for a lively discussion about what it means to be a CIO today. Learn what it takes to be a leader in the tech field from IT Visionaries, Paul Chapman, Juan Perez, Mark Settle, Susie Wee, and Mark Rackley. Andrea Brugger, Director of Salesforce Effectiveness for United Rentals, joins Ian to discuss the ways she has helped implement technology and mobile apps to make the construction industry more efficient. David Neely joins Ian to discuss how Transamerica has created a culture of innovation and the steps he’s taken to make citizen development a bigger part of what they do. IT Visionaries producer Aaron Gerlitz joins the podcast to discuss the most interesting lessons he’s learned from the first 40 episodes of IT Visionaries. Vala Afshar joins Ian for a discussion about how technology is impacting businesses and business leaders everywhere. They talk about how to engage with citizen developers, what the impact of AI and machine learning will be, and how CIOs must be where the buck stops when it comes to building trust with consumers. In this compilation episode, we pulled together some of the most interesting things past guest have said about what is going on in the mobile space. Guests such as Leyla Seka, Dion Hinchcliffe and more discuss everything from how they use mobile, to trends they're excited about to best practices. In this exclusive interview, Chad and Marissa discussed the early days of Silicon Valley, the lessons Marissa learned from Google and Yahoo!, and her best lessons for time management and productivity. Lisa Davis is a top 100 CIO award winner and currently works at Intel as the VP & GM, Digital Transformation & Scale Solutions, Enterprise & Government, Data Center Group. In this episode, Ian and Lisa discuss the future of IT, data centers and what’s coming for 5G networks. Tony Bradley is a regular contributor for Forbes and Editor in Chief for Techspective. In this episode, Ian and Tony discuss the balance of developing applications for desktop and mobile and how building an app for your employees is different than designing for customers. Ian sat down with Mike Fitzmaurice, Chief Technology Officer of Skybow. Mike shares with us his thoughts on low code development, citizen development and what the future holds for these two trends. Ian sat down with Dion Hinchcliffe, VP and Principal Analyst at Constellation Research. Together they discussed the value of low-code tools, how to lead digital transformation and the best tips to building your IT team. Ian and Chad welcome back author, podcast host, and thought leader Dr. Jonathan Reichental. Dr. Jonathan Reichental shares his thoughts on the 4th Industrial Revolution and what you can expect as it approaches. Arvind KC is the CIO of Palantir. In part two of this interview, KC discusses what defines a good leader and the seven qualities of a successful engineering leader. If you like this episode, be sure to check out part two! We host our first ever CIO Roundtable with Paul Chapman of Box and Mark Settle of Okta joining us in the studio. In this conversation, Ian, Mark, and Paul talk about how not to get fired in 2019, the difference between Marketecture and Architecture, and how to utilize metrics to your advantage. Ian sat down with Leyla Seka, Executive Vice President of Mobile for Salesforce. Leyla shares how she got her start with Salesforce, the way brands will win in the coming years and mobile as the fourth industrial revolution. Ian sat down with Earl Newsome, Vice President and CIO of Praxair. Earl shares how he got into IT, the lessons he learned from the military, and his seven habits for effective IT leadership. Ian sat down with Susie Wee, Senior Vice President and CTO of Cisco DevNet. Susie shares the story of how DevNet began, the essential skills that future IT leaders will need, and her advice for anyone wants to become a CEO, CIO, or CTO. Ian reviews the best moments from season one and previews what’s in store for season two. Season 1 of IT Visionaries brought terrific guests and their takes on citizen development. In this episode of IT Visionaries, here is the best of citizen development from this past season featuring takes on encouraging new developers to the benefits of implementing it. In this special episode of IT Visionaries, Jamie Smith, Chief Information Officer of the University of Phoenix, shares his thoughts on citizen development, retaining top talent, and why it’s important to understand that all applications have a life cycle. Juan Perez is the Chief Information and Engineering Officer of UPS. Juan has been a driving force in UPS’s evolution into advanced analytics, and in this conversation, he shares how UPS is optimizing delivery routes to improve service and efficiencies. He also shares lessons he’s learned while dealing with technical aspects for a logistics-heavy company and how to instigate change in large businesses. On this episode of IT Visionaries, Ian sits down with Paul Chapman, the Chief Information Officer at Box. Paul shares with us how to build an ecosystem of innovation, the future of work and how to become a better CIO. Ian sat down with Dr. Jonathan Reichental, Chief Information Officer for the City of Palo Alto. He is an award-winning technology leader, and in 2017, he was named one of the top 100 CIOs in the world. In this conversation, Dr. Reichental shared his thoughts on the future of blockchain and how cities are the perfect platform for innovation. Ian Faison sat down with Brian Hoyt, Chief Information Officer of Unity Technologies. Together they talked about how research and development drive Unity’s business model, why the best innovations aren’t noticeable at first glance, and why you should be looking outside the traditional recruiting areas for IT talent. On this episode of IT Visionaries, Ian sits down with Sophia Cui, Chief Technology Officer of Jobscan. Jobscan gives job seekers an instant analysis of how well their resume is tailored for a particular job and how to better optimize their resume. In this conversation, they talk about start-up mentality, how to attract the best and brightest talent, and how GDPR is influencing the future of cybersecurity. On this episode of IT Visionaries, we welcome Zach Gray, Chief Technical Officer of MS Companies, an organization that provides workforce solutions to manufacturing companies to help increase their efficiency. Zach shares with us how he scaled innovation and application development at MS Companies through Citizen Development, and what the future looks like where everyone, not just IT, builds apps. IT Visionaries is brought to you by the Lightning Platform by Salesforce. The Lightning Platform is a leading cloud platform that makes building AI-powered apps faster and easier. With Salesforce, now everyone is empowered to build apps for their organization! In this episode, we sat down with Chief Information Officer of Okta, Mark Settle. Mark is a seven-time CIO and shares his playbook for how he approached taking the role of CIO. He gives tactical tips for new CIOs and explores the new wave of authentication software on the horizon. In this episode, Ian sat down with Sudheer Sura at Dreamforce 2018 to discuss SaaS, solution architecture and software development. Sudheer is the IT Director at BMC and has been in the IT field for more than 20 years. In this episode, Ian sat down with Kamran Ziaee and Cindy Breshears to discuss the changing role of IT in the business world. Kamran leads the global IT team at Centurylink. Cindy Breshears is the Chief Transformation Officer at Bluewolf, an IBM Company, where she provides advisory digital transformation thought leadership for IBM and Bluewolf. On today's episode of IT Visionaries, we are joined by Frédéric Chanfrau, the CIO of Citizens Bank. With extensive CIO and executive experience at companies like Schneider and Ernst and Young, Fredric now heads IT and drives digital initiatives at Citizens Bank. His new charter is to innovate the core IT at Citizens and lead them through the massive fintech disruptions that the industry is currently experiencing. Alpna Doshi is the CIO of Philips. Philips is a major player in healthcare, with an audacious goal to improve the lives of 3.5 billion people by 2025. As CIO, Alpna has driven transformational initiatives like transitioning to cloud-based IT. She has a laser focus on aligning IT with business to drive groundbreaking innovations around things like mobile, internet of things, and Robotics. In this episode, Ian sits down with Amber Baldet, the CEO and co-founder of Clovyr, a start-up that helps new companies break into blockchain development. Before founding Clovyr, Amber led JP Morgan Chase's blockchain department. Together, they're going to talk about blockchain, bitcoin and what Amber believes the future holds for information sharing technologies. On today’s episode of IT Visionaries, we are joined by Japjit Tulsi, the CTO of Carta. In his 20 year career, Japjit has led engineering teams at Google, Microsoft, and eBay. He’s helped build products like Google Analytics and, most recently, ShopBot, eBay’s AI tool which combines artificial intelligence and commerce to create a highly personalized shopping experience. In this episode, we discuss the future of AI, Japjit's favorite chatbots, how cloud computing is becoming a commodity, and what Carta is doing to change cap table management. On today’s episode, we are joined by not one, but two guests from JP Morgan Chase - Munish Kumar and Sandra Nudelman. Munish is Vice President of Technology and Sandra is the Chief Data and Analytics Officer. In this episode, Munish and Sandra share insights about the relationship between data, customers, privacy, legacy systems, and agile innovation. They also discuss the impacts of GDPR and CCPA, and share a few predictions for the future of technology and how it will impact businesses. Salesforce and Harvard Business Review recently teamed up to create a study showing how you can use the latest technologies and leadership practices to close the customer experience gap in your business. Jo-Ann Olsovsky has been involved with technology since she first stepped out of school and into the working world. At age 19, she worked at AT&T as a technician repairing network gear and modems. She progressed through the ranks becoming an engineer, project manager, and then a manager. After that, she became Director of Enterprise Network Services and Technology Support Services at GTE Verizon before moving to Telecom where she continued her track record of achievement. First as Assistant Vice President, then becoming VP and CIO, and finally SVP. By this point in time, the energy of the Salesforce community was becoming contagious, so Jo-Ann left Telecom to become the Executive Vice President and CIO of Salesforce. Jo-Ann joins us today to discuss aligning business strategy with IT strategy, empowering citizen developers, and how to select new technologies for your business. Dr. Nersi Nazari is the CEO of Vital Connect. He is a serial entrepreneur with over 30 years of experience in medical device technology and venture funding. Prior to VitalConnect, Nersi served as CEO of Teranetics which was later acquired by PLX Technology. In this episode, we are joined by Alex Wright-Gladstein, CEO and co-founder of Ayar Labs. Ayar Labs has developed new electronic-photonic integrated circuits that move data using light instead of electricity. Neil Kumar is the CTO at Karat. As one of the first 12 employees at Yelp, Neil grew the engineering team from himself as an individual contributor to over 200 engineers. In this episode, we discuss best practices for how both tech and non-tech companies can hire technical talent, including how to speed up the hiring process, eliminate bias, and improve the candidate experience. Cindy Breshears is the Chief Transformational Officer (CTO) at Bluewolf, an IBM Company. In this role, Cindy is responsible for providing digital transformation leadership for Bluewolf and IBM strategic accounts. She has been a CIO for multiple organizations over the last 16 years and recently sat down with us on IT Visionaries to discuss one trend in particular that is taking over the IT landscape: customer experience. Alvina Antar is the CIO of Zuora and known as ‘The Subscription Economy CIO.’ She previously spent 17 years at Dell focused on Digital Transformation, Global Delivery, and Mergers and Acquisitions. We had Alvina on IT Visionaries to discuss her road to becoming CIO, the challenges that CIOs face as they transition to this subscription economy, the changing role of IT, and how CIOs need to be visionary. If a company hopes to last in today’s quick-paced, data-driven world, then the CIO and IT department must function at the forefront of innovation. On this episode of IT Visionaries, we have Craig Walker, VP and Global CIO of Shell, join us to discuss how established companies can encourage innovation, incorporate new tech, and utilize the massive amounts of data they are privy to. Welcome to IT Visionaries, your #1 source for actionable insights, lessons learned, and exclusive interviews with trailblazing IT leaders. When you subscribe to IT Visionaries, you’ll get two weekly episodes. Each is packed with value, stories, and trends - all directly from leaders on the frontlines of technological innovation. You’ll also learn how these leaders are driving innovation inside their own organization, and how you can implement similar strategies… all from the brightest visionaries in the world. We’re honored to have you join us on this adventure. Now sit back - subscribe to IT Visionaries - and prepare to start living in the future.